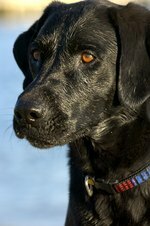 Both black Labradors and German shepherds are known for their guarding, retrieving and hunting abilities and both are highly intelligent working dogs that adapt well but may need extensive training to thrive. Black Lab/shepherd mixed dogs often retain the best qualities of both breeds and look forward to daily exercise and training. The trick to training a black Lab/shepherd mixed dog is to engage the dog's brain through constructive, enjoyable training while also ensuring the dog receives adequate exercise. Black Lab/shepherd mixed dogs often develop overly aggressive biting habits because of both high energy levels and innate retrieving instincts. You must be clear about setting boundaries as to what behavior is acceptable. If the dog bites, remove the dog's mouth from the object and say "No" in a firm voice, walk away from the dog and ignore the dog for 30 seconds. The dog will associate lack of attention from you and will cease biting. In more severe cases of biting, you can also fill a soda can with pennies and shake it when the dog bites in addition to saying "No." It is important that you develop a training plan that builds on the goals you have for the dog. If you are using the dog for hunting, you need to develop a training plan that focuses on commands that promote safe behavior in the field. For example, you will want to spend extra time teaching the command "leave it." 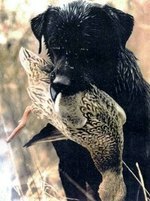 Working dogs love to retrieve things, but they often do not like to release the object. High energy working dogs often engage in destructive behavior simply from having too much excess energy. Daily running, walking and playing games like fetch and Frisbee will go a long way toward helping the dog focus on training. Dogs learn through a reward system based on positive reinforcement such as praise and treats. Working dogs such as Lab/shepherd mixes, with their high intelligence and high energy levels, are also known for a high degree of willingness to please and respond particularly well to a reward-based training system. It will take some time for the dog to learn a desired behavior. You can use a technique called "shaping" to promote a desired behavior. Over time, you will gradually ask more from the dog before rewarding the dog with praise or a treat. You can also use a "clicker" to let the dog know that you are pleased with its behavior by immediately clicking it before you give the dog a treat. You should always use the same commands for each task such as "Sit" and "Stay." All people handling the dog should use the same commands in the same manner. You might also post a list of commands with instructions so that everyone handling the dog has an opportunity to become familiar with the dog's level of training and response to commands.